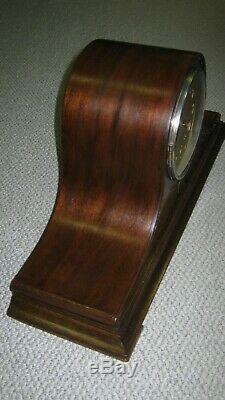 Please consider this antique Seth Thomas 8 day mantle clock with the Westminster chimes. 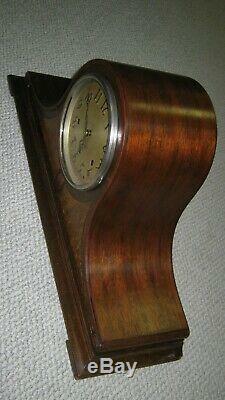 The clock is 21 and 1/2 inches wide, 10 inches tall and 6 and 1/2 inches deep. The clock movement has been disassembled, cleaned and then tested for two weeks to verify good timekeeping and chiming process. The movement is marked as Seth Thomas and model 124. The clock plays the Westminster melody at each quarter hour and then also counts the number of the hour on the hour. The wood case has the original finish and is in good condition. The dial is metal and has the raised brass numbers. Brass bezel has good glass and closes correctly. Rear door also closes correctly. 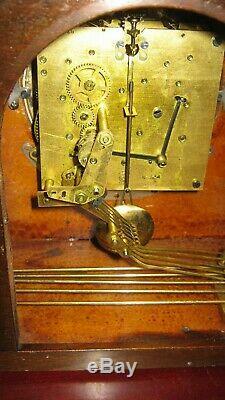 The pendulum appears to be original to the clock while the key is a correct replacement. Seth Thomas sticker on the bottom indicates Number 60 Chime. The item "Antique Seth Thomas Westminster Mantle Clock" is in sale since Thursday, March 21, 2019. This item is in the category "Collectibles\Clocks\Antique (Pre-1930)\Shelf, Mantel". The seller is "igottahave" and is located in Pasadena, Maryland.